Automotive Ethernet has established itself as a standard communications structure. All major manufacturers now depend on this cost-efficient solution for fast data transmission in motor vehicles. With the new IEEE 1000Base-T1 standard, the success story continues. Rohde & Schwarz is the first T&M equipment manufacturer to offer a compliance test solution for 1000Base-T1. Rohde & Schwarz introduces the R&S RTO-K87 option, the first compliance test software on the market for automated testing of IEEE 1000Base-T1 interfaces. Fast data transmission within automotive Ethernet networks is critical for driver assistance systems as well as for autonomous driving applications. Rohde & Schwarz has been an active participant in IEEE and OPEN Alliance, using its expertise to help drive the development of a reliable test solution. 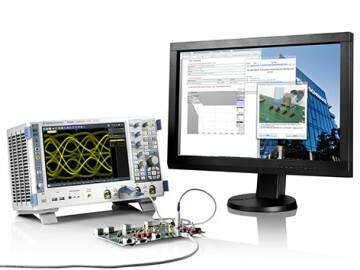 On the R&S RTO digital oscilloscope, users can now perform the tests defined in the standard and assess the reliability of data communications over 1000Base-T1 interfaces. When used in combination with the optional R&S RTO-B6 integrated arbitrary waveform generator, the R&S RTO2000 can independently generate the required 125 MHz interfering signal – no additional instruments are required. The R&S RTO-K87 compliance test software includes pictorial instructions that guide users through the measurements step by step. The oscilloscope is automatically configured and the results are documented in a straightforward test report. The software additionally supports the standard's return loss and mode conversion measurements, which are performed on a Rohde & Schwarz network analyzer. The Rohde & Schwarz compliance tests for 1000Base-T1 and 100Base-T1/BroadR-Reach as well as the trigger and decoding options for LIN, CAN, CAN-FD, FlexRay and CXPI provide the automotive industry with a comprehensive, yet compact test solution for ECU development. The R&S RTO-K87 compliance test software option for 1000Base-T1 is now available from Rohde & Schwarz. For more information about Rohde & Schwarz automotive solutions, visit www.rohde-schwarz.com/ad/press/rto2000.